This July 2017, the the Iclif Leadership and Governance Centre (Iclif) and Vertical Distinct will host an intimate gathering of senior HR and business leaders from Malaysia’s top organisations. Bringing together pre-eminent HR and business leaders, the discussion will centre on the impact points created by the shift of leadership and what HR can and should review and do in order to remain relevant and possibly, be one step ahead. In the era of disruption, this involves looking at what all of this means to the talent management, HR and leadership teams. We look at the different implications that may result from adjusting HR policies, launching new strategies as well as introducing creative ways of working together. We would like to invite you, and combine the expertise of all the leaders like you in the room, to brainstorm and uncover insights and new solutions. These are some of the issues that will be discussed in the next HR Breakfast Roundtable, Redefining Leadership in the Open Source Era, this July. 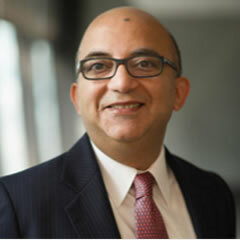 Featuring a keynote by Rajeev Peshawaria, Iclif Chief Executive, this Roundtable will provide an opportunity to preview Iclif’s latest proprietary research of leadership shifts in the 21st century, in conjunction with the launch of Rajeev’s third book, The Naked Autocrat (McGraw Hill October 2017). Conducted by 15,000 leaders across 27 countries including Malaysia, the research will suggest that in order for organisations to achieve breakthrough success, a shift in leadership style is critical. Join us and be the first few to find out what has shifted and what should be adopted. 12.30PM – 2.30PM Luncheon. All guests are also cordially invited to stay for lunch to continue the discussions. Be the first few to access the latest global research from Iclif. Author of Too Many Bosses, Too Few Leaders (Simon & Schuster 2011), Be the Change (McGraw Hill 2014), The Naked Autocrat (McGraw Hill Oct 2017), and a regular writer for Forbes, Rajeev is the CEO of the Iclif Leadership And Governance Centre. He has extensive global experience in leadership development with a particular focus on uncovering personal and organisational “Leadership Energy,” and developing and delivering business strategy. Rajeev’s professional roots lie in industry. He has been Chief Learning Officer of both Coca-Cola and Morgan Stanley and has formerly held senior positions at American Express and Goldman Sachs. At Goldman, Rajeev helped found Pine Street – the firm’s acclaimed leadership academy – and headed Pine Street for Europe and Asia. In his early career, Rajeev was a banker and currency trader. He has provided coaching, consulting and advisory services globally. 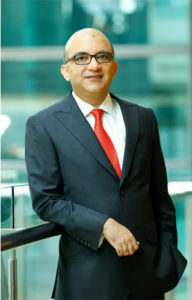 His clients include Deutsche Bank, HSBC, Mitsubishi, Johnson & Johnson, MetLife, The World Bank, US Treasury, US Securities & Exchange Commission, Indian Railways, Sinarmas Indonesia, Allianz, Permata Bank Indonesia, PwC, Nestle, Mohammad bin Rashid School of Government Dubai, Prudential, Maybank, Great Eastern, Citibank and many more. He also serves as guest faculty at leading business schools in the US, Europe and Asia. Rajeev is a sought after international speaker and has been widely featured in international media platforms such as Bloomberg TV & radio, National Public Radio (NPR), Harvard Business Review, CNBC, Fast Company, Leader to Leader, American Management Association (AMA) magazine, Leadership Excellence magazine, The Times of India, The National Dubai, Mint-Wall Street Journal and the Conference Board. An exclusive, invitation-only event for preeminent HR and business leaders in Malaysia, this Breakfast Roundtable is a half day event that will combine the expertise of all leaders in the room to uncover insight into the pressing leadership issues outlined above in order to remain relevant. Where will the Roundtable be held? At a five-star hotel in Kuala Lumpur. Details will be sent once your seat is confirmed by email. Who will attend the Roundtable? 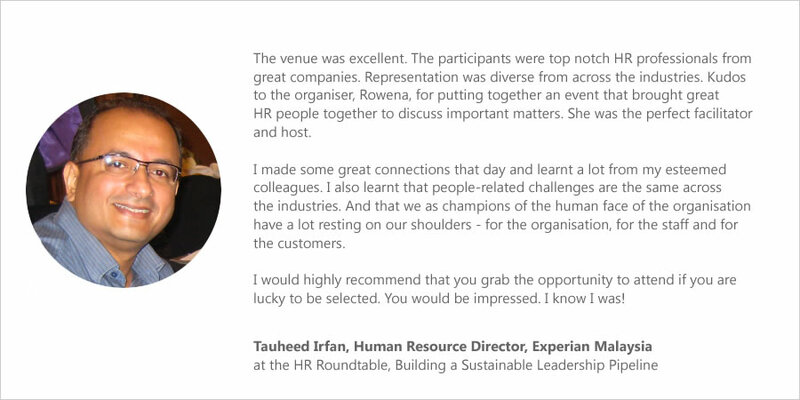 Between 11- 14 guests in total comprising HR leaders across a range of industries. All guests are senior level decision makers. They may have oversight over national, regional or global portfolios. This Breakfast Roundtable is by invitation only. Attendance is limited in order to maintain an intimate dialogue among all participants. If you are interested in attending, please drop us an email to request an invitation. As seats are limited, early expression of interest is advised. The size of the workforce of your organisation nationally. If your organisation has a regional or global presence, please also indicate the size of the global workforce population. If criteria are met, you will receive a confirmation email of your seat allocation. Please note that your RSVP is no guarantee of invitation as seats are limited. Your seat is guaranteed when you receive an email from us confirming your place at this gathering.